A bitter row over a tiny strip of land on a Wigan street has resulted in a businessman stacking large steel girders outside his rival’s house. Mell Street, who owns the award-winning Ashfield House Hotel in Standish, blocked access to Geoff Martin’s property after talks to buy the section of Cedar Avenue under discussion collapsed. The strip of land, about six feet wide, runs the entire width of the road and includes the access to Mr Martin’s home. He says he has reported the matter to police but they cannot act in a civil matter. Mr Street snapped up the freehold to the land back in 2007 for just £1 plus fees but later slapped a £100,000 price tag on it during fraught negotiations with Mr Martin. He installed the barriers after Mr Martin balked at the eye-watering asking price during talks several years ago. Mr Martin is now unable to access his driveway with a vehicle and insists there is a safety issue as the girders prevent emergency vehicles from getting to his property. Mr Martin said: “We came home on Monday evening to find our driveway was blocked with four big steel girders. “The house is quite a distance from the road and I’m concerned that a fire engine or an ambulance wouldn’t be able to get down. “They are a few feet high so we can climb over them or go round them but it means we can’t park our cars outside our house or get them in and out. “This has all come out of the blue. I just came home from work to find the girders. However, Mr Street says the six-figure sum was one mutually agreed between Mr Martin and himself only for Mr Martin to then pull out. 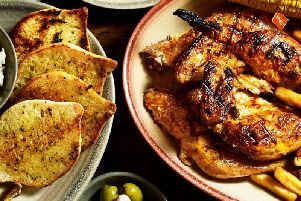 Will Wigan EVER get a Nando's restaurant? He has also defended his actions, saying the issue needs resolving. He said: “I feel sorry for Geoff actually because he has taken on the property without being told about the land ownership situation. “I’m not trying to cause any trouble, I just need to sit down with him and talk about it but at the moment I can’t. “When you can’t get someone to negotiate you’ve got to do something. It’s my land, I can do what I want. “I don’t want to distress the family. This is a warning shot to say he needs to speak to me. “I sent him a text a few months ago and said he needs to either lease this land or buy it off me. I said I would block it off if he didn’t but the cars were parked outside the gate when I went round. Mr Street originally bought the land at the very end of Cedar Avenue in order to “ring-fence” his property, he told the Post. Mr Martin said the issue of the driveway being blocked was raised with Greater Manchester Police (GMP) earlier this week. The Emergency Workers (Obstruction) Act 2006 covers hindering people working for the fire brigade, police, NHS or other rapid response services but says it is an offence to prevent someone actually responding to an ongoing emergency incident. This means serious harm to either people or property must actually be happening or about to happen imminently. A spokesman for Greater Manchester Police was unavailable for comment when contacted by the Wigan Post.